Bricks have been used in England for construction for many hundreds of years. They are literally the building blocks upon which are country stands today. However for the origins of brickwork we must go back to 7000bc to Southern Turkey and Northern Jericho. This is where the first use of bricks were recorded. These first bricks were actually sun dried mud bricks but it was quickly found that fired bricks were far more durable and their use in permanent buildings then became more widespread. The Romans then took brick construction to another level, They created mobile brick kilns and produced many sorts of special bricks for different construction purposes. The bricks were stamped with the legion of the supervisor. These mobile kilns were moved throughout the empire for building public and private buildings during the first century of Roman civilisation. It was the 12th century that bricks were reintroduced to northern Europe which created the brick gothic period. The bricks used in this period were mainly red fired clay bricks which would of been more similar in appearance to the bricks of today. The renaissance and Baroque periods that followed was a very bad time for bricks as they were generally covered up or “hidden” with plaster. Fortunately Brickwork was on the way back during the mid eighteenth century with Brick walls and facades gaining popularity again. Bricks are now used more often in England for construction than any other material except wood. Advances in technology, production have resulted in many different types of bricks, styles, strengths and sizes being available. To this day bricks remain reliable, tolerant to the weathers of this island and resistant to pollution, acids and fire. 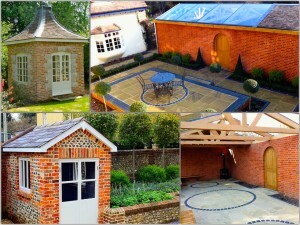 At New Leaf brickwork we use bricks for many uses in the gardens and outbuildings we produce today. We like using reclaimed bricks for buildings or features, we also use reclaimed brick paviors for providing additional terraces to period country houses. Another type of brick we really enjoy using is the hand made variety. With each one being slightly different they have unrivalled character and style. These can be used in Walls and buildings for that extra special appearance. 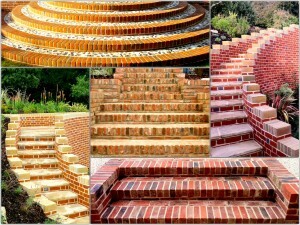 There are so many possibilities for the use of bricks in the garden. Different laying patterns or bonds, mortar colours and pointing styles will all make brick constructions unique to your garden. Bricks can also be combined with natural stone, whether it be “flint work”, “Purbeck stone” or one of our personal favourites “York stone”. These materials combined can make so many interesting features and focal points within the garden. Walls, Steps, Seats, Fountains, Terraces, Entrance ways. The possibilities are only limited by the imagination.